The biblical book of Ecclesiastes is full of slogans, lessons, nuggets and tweets, really. The author is intent on sharing life lessons for future generations to avoid and learn from. One of those themes is clearly about how there is a time and season for everything! The good, the bad, the hard, the easy, etc. And that's the final word I'll share about my 2016. I end this year with an "Ecclesiastes attitude". In 2016 I have mourned and missed many things. But I've also learned and developed many things. I've missed leadership. I've missed exercising some of my God-given gifts. I've missed teaching. I've mourned influence. I've mourned relationships with people that are now thousands of miles away. I've missed traveling. I've missed my Father, mother and siblings more than any other year I've lived overseas. I've mourned what seemed to be loss of purpose. I've missed team. I've mourned community. I've missed nations. I miss South Africa. I miss America. I miss English. I miss smooth roads. I miss feeling needed, wanted, significant in the eyes of people. But somehow in the midst of all this, I sense a deep knowing that this is the time and season for this. There's a time and as season for everything under the sun. But I've learned and developed so, so much. It helps me to open my eyes and name it. Allow me to share some with you. I've learned that I'll never find true value from position or title. I've discovered that I'm loved by God our Father and that's final. I've learned that it's enough to be a hero at home. I've developed some much needed patience. I've discovered that Davis needs more affirmation, Lily could care less about affirmation and needs my focused attention, and babies can actually bond and be attached to their Dad (never experienced anything like this with Davis or Lily because I worked too much). I've learned 600+ words in Kiswahili and can now have a (messy and broken) conversation with people in Tanzania. I've seen that I'm more stubborn than I thought...sometimes I have to make the same mistake multiple times to learn. I've discovered that my emotions are a gift-- if I let them whisper to me -- and a detriment if I let them yell at me. I've learned that I like to stare at the stars at night. I've come to see that I talk too much and share too openly. I need more wisdom. I've developed a whole new skill set in the kitchen, with new foods and new techniques. I've learned that seasons of decreased outer activity create space for increased inner activity. I've developed my sense of identity far more through the uncertainty and change than I ever did through safety and predictability. I've decided that powerful politicians and poor, illiterate gardeners are equally worthy of my love and friendship. I've discovered that life lessons I thought would take me 1-2 years to get are still coming at me and don't look like they're going away anytime soon. And I've found that the Jesus kingdom is coming all around us if we would have the eyes to see it and the courage to join it. There's a time and a season for everything. Life ebbs and flows. My heart is hopeful and grateful for what I sense this next year will teach me. I want more and more of the way of Jesus to become the way of Noah, Tricia and these kids we've been entrusted with. Here is my own definition: The insight to see ourselves as clearly as God and others do and to self-identify our motivations, brokenness, strengths and relational aptitude. It is to watch our own movie and receive our own signals. Self-awareness is a grossly underestimated quality of life, friendship and leadership. It is that refreshing thing about someone that makes you like them pretty quickly and feel comfortable and safe. Self awareness is one of the greatest gifts we can give other people because it drastically decreases relational anxiety. Nothing is worse than being in the company of one who has limited knowledge of their behavior, words, tone, body language and choices. When someone lacks self awareness, they are often also emotionally unintelligent. This means that those with more insight are carrying the weight of responsibility for helping them. Do they see this? Do they know how that sounds? Can they sense that they are hurting him/her? When the other is unaware, and we are aware, we are left with the dilemma of if, and how, to assist them toward growth. They know what they are and what they are not. Where they are strong and weak. Where they have experience and where they lack it. They know how others perceive them and adjust accordingly. They know who is in the room and what's appropriate. They have a way of zapping the anxiety out of an environment. They are hungry for feedback and welcome your input. It produces relational safety and creates stability. It welcomes others into increased self awareness themselves. Here is the cool thing. Self-awareness isn't one of these traits that you've either got or you don't. No. I think there are a number of fruitful ways in which we can increase and grow our levels of self-awareness. I will share about them in an upcoming post. Issues of insecurity and identity of the human heart are something I'm quite interested in these days as I focus my final masters project around it. Not to mention, I've got plenty of personal experience interacting with both. I'm starting to think that when it comes to issues of insecurity in relationship to others, the image of a seesaw at a playground points to something worth considering. When one side raises, the other lowers. When one side is high, the other side is low. When fear of man is high, fear of the Lord (the healthy kind) is low. When the fear of the Lord is high, fear of man is low. I've only got so much emotional care-width. I'm either getting my value from you or Him. Or when I'm super concerned about man's validation, I'm less concerned about God's. Almost in direct proportion. And think about this one...criticism hurts to the same degree that praise helps. If you feed off people's affirmation, to the equivalent degree you'll shrink at their disapproval. It's like a seesaw. So, the less you need/want their praise, the less you'll mind their disappointment. The answer is simple to see, but hard to activate. Disconnect your sense of identity from other people or the things you accomplish, and root it firmly in God's perspective about you. Which are final, and rather spectacular! Then, you'll be off the seesaw ride. Which is great, because those things hurt after a while. I just rode one the other day with the kids. I know many missionaries. And many of them are well established, well protected, well funded and simply do not NEED anyone in their local ministry context. I don't want this to be true of us, but without careful attention, it could. A friend recently forwarded me this article from Nik Ripken about Western Missionaries. It really provoked me and moved me. Essentially, here is what it was about: Local Somalian believers were interviewed about "a man they truly loved." The man was a missionary. But why was he so loved? What did he do so right? Again and again, locals were pressed to reveal what they so appreciated about this man. Finally, it came out. When this missionary’s father died, he came to us and asked for our help. We didn’t have much, but we gathered an offering of love. We bought him a plane ticket so that he could go home to America and bury his father. This man and his family give everything they have to the poor. They struggle to pay rent and school fees, and put meat on the table. And when he has a great need, what does he do? He doesn’t go to the other Westerners for money. He comes to us. He comes to the scattered and the poor, he comes to local believers, and he asks for, and gets, our help. Do you want to know why we love him? He needs us. The rest of you have never needed us. THIS has me thinking. And feeling. And wondering. Maybe I will never "need" local friends financially. Maybe I will. Perhaps there are many, many others ways in which I need them? What are they? I am wrestling with this. I WANT to NEED my Tanzanian friends. And in may way, so far, we HAVE! But we still have so much to learn. Leaders are readers. I do love to read, because I love to learn and grow. When we finally got all our bags to one place...from Dar and Nairobi and South Africa and America...and got them all unpacked I was pleased to realize that so many of my books made it here to Tanzania (though I've parted with hundreds over the last 6 years). Of course, only the special ones made the cut. Anyhow...something neat emerged as I looked at my bookshelf more closely. Almost half of the books I own have been written by personal friends or acquaintances...people we know. It brought me joy and pleasure for how God has expanded our web of relationships and broadened our global network of quality leaders we interact with. We feel honored to be connected and it just makes these books feel like more than just books. Enjoy the photo I took of them. Maybe you know some of these authors too? I think we underestimate our role as HEALERS and instead tell God to do what he asked us to do. We ARE healers. I was reflecting on this as I preached at a local church a few weeks ago and told the church that they are ALL healers and asked them who they plan to heal this week. We carry in us the love, life and power of Jesus and our actions, our words and our compassion can heal people of all kinds of pain and brokenness. Henri Nouwen calls us "wounded healers." In fact, it troubles me that there is only ONE place in the bible where we are told to pray for the sick (James 5) and even more strange that in the Gospels and Acts no one did so! Jesus did not tell us to pray for the sick. He told us to heal them. I actually think that healing is just one of the many, many roles that we have bounced back to God instead of BEING Him like He asked us to be. Missions for starters. I would guess that most people do not firmly believe they are a healer. If that was decidedly a part of your sense of identity, I wonder how it would change your interactions today. Who would you heal if you thought you could? And just to be clear, I am talking about a lot more than just physical healing. It is my conviction that emotional sickness from lack of love plagues far more people than does physical sickness for lack of health. Woke up to this hanging on the wall. My Tricia does it again. I've never really been a birthday guy. Everyone has one. And they come around so often. Maybe it's the commercialization that I resist. Anyway...I'm feeling a tad more emotional this morning than I have most birthdays before. I feel so thankful...For the way God lead and carried our family through this last year. One year ago right now we were preparing to travel to Tanzania to scout. Now it's home. So much has happened this year and we are humbled. 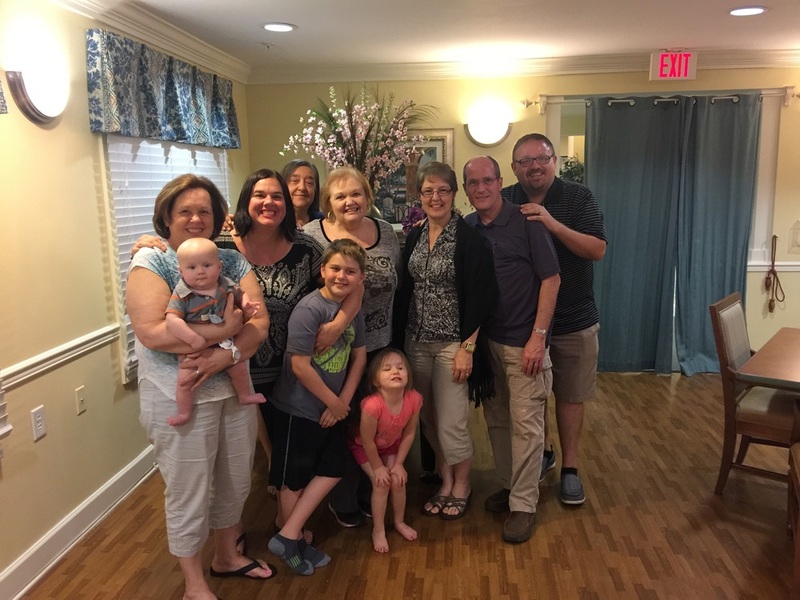 I feel so thankful...for a met budget, a supportive sending church and family, for Pat and Joni Kellar being with us for our landing here, for the new friends we are making here, for the joy we are experiencing as we begin to dive into Swahili. Thankful. I feel emotional...about what we miss. I miss our family back in the states. I miss Cape Town and our community there. I miss cheese and ease. I feel emotional...about the future. The adrenaline is wearing off and reality is setting in. I was able to keep myself distracted furnishing the house. Now it's becoming real. There's nothing here for me to attach my identity and value to (like I have all my life). I now have no choice but to get it...I'm a beloved son, a husband and a Dad. That's it. No other status, role or position. I don't get to display my gifts for all to see. I get to sit down, shut up, and struggle to learn a language and a culture foreign to me. The year ahead will be hard, but beautiful. Painful, but rewarding. Seemingly insignificant, yet somehow one of the biggest turning points of our lives. I feel it, I just can't explain it well yet. Well, those are some random birthday feelings. Cheers to another year of adventure with Jesus. I love you dear friends around the world! I know no one knows this, but I have addictive tendencies (😉). And when I get excited about something, I get excited...maybe even emotionally charged!! Well, I think I'm addicted to Swahili. I know we will have a love hate relationship later. But as for now I'm diving in and swimming. Talking with everyone I can find, practicing the same things until I get it, and teaching my family (as if I know what I'm talking about). Vulnerability and authenticity is something I would like to think comes fairly natural to me. It feels that way and I’ve been told so a few times. Not because I necessarily like how it feels, but because I have always known deep down that it is the only path to real relationship. People hate fake. In fact, I have always said that it takes way more energy to upkeep a false image than a real one. The former requires you to act. The latter requires you to BE. While I could say much more about this, allow me to direct you to a 20 minute TED talk that may very possibly be best talk on this topic that I have ever heard (thanks to my friend Dave for sending to to me). Check this out. It is worth your time. The trip over was unbelievably smooth. Two flights, eight hours each, and all 21 bags made it. Thank you, KLM! We stayed at the Kundayo Serviced Apartment Lodge in town and it worked perfectly for our family. We really liked the owner, Mazo when we met him last July and are so glad to have him as a friend. The story of how we got our home is a neat one that I can’t tell in full here, but the bottom line is…God selected our home and handed it to us because of one email I sent last December. It is a brand new house no one has ever lived in and the owner is an elder, a man of honor, a wise business leader, and well respected in Tanzania. I am not sure who is happier with this fit…him or us! Tricia is complaining that it’s too large, but the kids are discovering that it makes for some mean hide and seek. It is situated about 10 minutes off the Tarmac road surrounded by corn fields, a local school, a small village, and an engineering company. I like the mix of residential, educational and commercial in our vicinity. We are in Njiro if you want to google it. We began furnishing our home Saturday and haven’t stopped since. It is an adventure and challenge like few things I have ever done. I am well aware that I am running on adrenaline. My favorite part of the process has been the PEOPLE it has forced us to get to know. They say that you want to be sure to NEED locals and rely on them. Well, that has come naturally for us as we would have been absolutely dead in the water without them. The new local friends and neighbors we are meeting have had to show us how to get electricity, how to operate all these locks, where to find furniture, who to make a deal, which way to get out of our neighborhood when it rains (our roads are BAD)…and last night I even needed to go borrow a pot to cook in. Protas, our go-to guy for all repairs and issues on our home and compound who lives 4 plots down and happens to have a 9 year old, 4 year old and 6 month old…sound familiar? Narry, the Brother of our shipping agent in Maryland who received our goods here in Arusha and refused to let us pay him. He and his wife own the well known Planet Lodge here in Arusha. I could continue, but I will stop there. I think you get the point. Is this cool or what? Our first objective is to settle in and make a home. As we do that we will make friends with local people, incidentally our second objective. 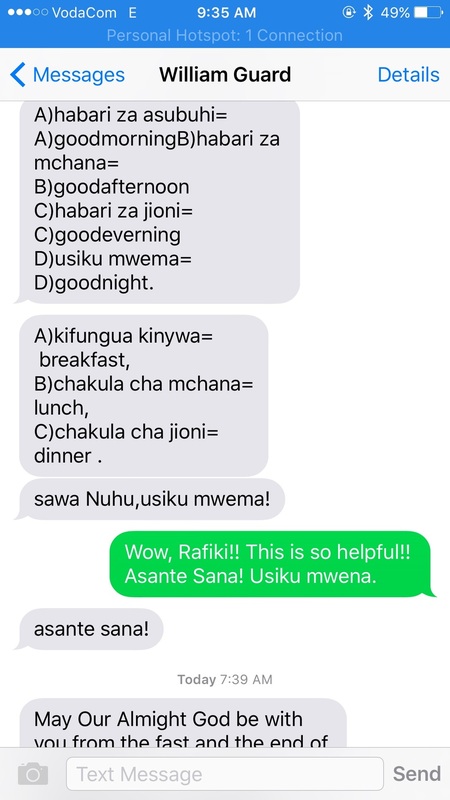 Each day we work on our Swahili, and boy do we need it here! Speaking of Swahili, when we got home from some errands yesterday the kids greeted us with joy to show us that they had learned to count to 10 in Swahili (thanks to Mama Agnes). They are going to be fantastic language teachers. Well, today we head back to town for a bunch of things— most importantly, mosquito nets. Our kids look like they have chicken pox. Thankful there isn’t Malaria here in this area. Pray especially for Tricia and Davis. For Tricia, the adjustment will take time and she longs to have a home set up for us. For Davis, he is dealing with fear at night. We see God here. We feel Him near. And we hear him encouraging our hearts even in the hard moments. When I met Floyd McClung in 2010, I knew he was going to shape my future. What I didn't know was that a year later, my family would move 10 minutes from his home and join him in ministry. And I certainly wouldn't have been presumptuous enough to think that he would ask me to lead a school he pioneered or mentor me in leadership. But he did. A high honor, indeed. About 13 weeks ago Floyd became seriously ill and has still not recovered or returned to normal. He remains largely unresponsive and immobile. 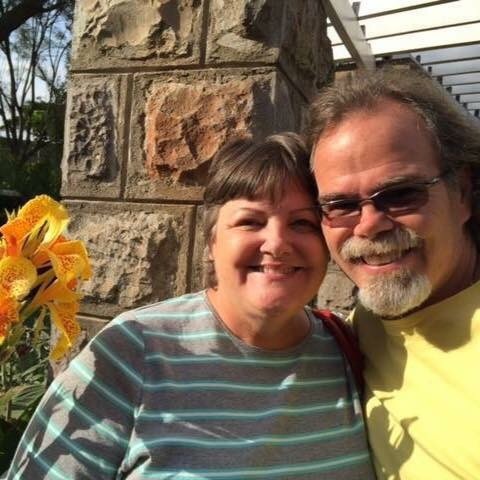 His wife Sally continues to stand by his side and thousands of people around the world are praying for his healing. I hate that it hasn't happened yet. And I don't understand why, especially with all this prayer. But I know that Floyd knows how good Jesus is regardless of what happens here. Jesus is his favorite topic! I miss Floyd. I miss walking on the beach with he and Sossy (his dog, who is his counselor). I miss his big hugs where I just buried my head into his torso, because reaching his neck was out of the question. I miss Skyping with him. And I'm really missing his counsel right now as we get ready to move into this next season of ministry. If anyone can stir up vision and beef up your plans, it's Floyd McClung. It's my belief that he is one of the leading influential voices of mission in our generation. Would you stand with us in continuing to announce the goodness and love of God in the midst of this frustrating moment for Floyd and Sally? And can we add our faith to theirs that Floyd would be made whole? We know this...God is able! Come on Floyd, we want more of what you've got...there aren't many like you. If you would like regular updates about Floyd's health you can get them by clicking HERE. Call it a home leave. Call it a furlough. Call it a visit. Call it what you want. Just don’t call it easy. If you are tempted to feel jealous that we got a seven month holiday in America, resist the Devil, he is a liar! 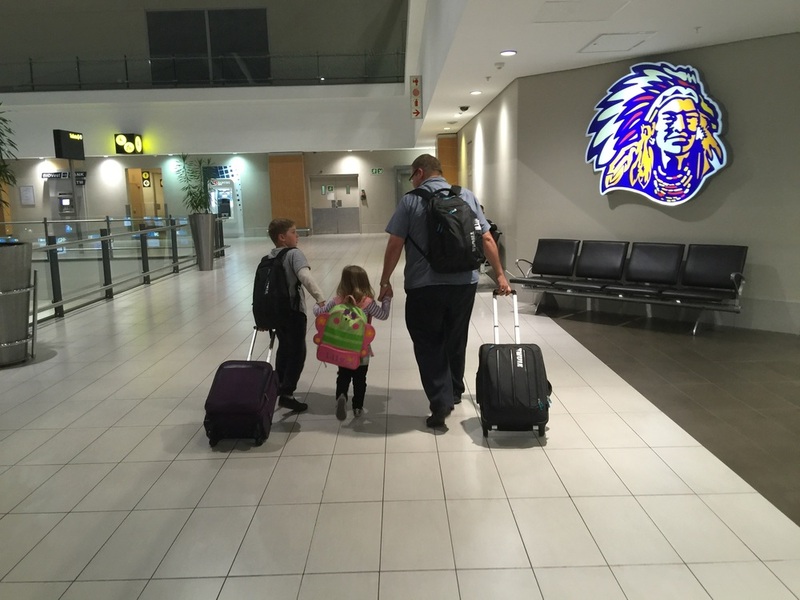 We arrived here in the states from Africa on October 12, 2015. We leave again on June 1…just 16 short days from now. Seven and a half months of home leave, which is full on transition and craziness, for a family of four and now five. 1. Emotional overload. Reverse culture shock meets lots of other weird emotions around being “home” and missing “home” and causes an otherwise healthy person to be a hot mess. 2. Schedule intensity. The window is short. Gotta run. Gotta pack it in. Breakfast with the Smith’s, Dinner with the Johnson’s, speak here, visit there, etc. 3. Relational pressure. Amidst all the other pressures of networking and fundraising, does family get any time? Or is our time only for those that can write checks? Major inner conflict, usually revealing who you are trusting in…but that is for another blog. 4. Practical Stupidity. Basically, not that I am writing from experience or anything, missionaries on home leave make some dumb decisions about where to stay, what to drive or not drive, how to plan, etc. Poverty mentality rules the day and the poor servants make poor decisions that end up costing way more than they ever wanted to spend. Hope you are tracking with me. 5. FOMO. And just some good old fashioned FOMO (fear of missing out). You want to do everything you can, go everywhere you want, connect with everyone you miss and you don’t want to pass up any good opportunity. The clock is ticking and your departure date is nearing. Now, in full disclosure. We learned the above lessons the hard way…by doing them. Our last visits to the USA were super difficult and we left more beat up than renewed. So, Tricia and I committed to get this one right if it was the last thing we did. And we succeeded! This has been an exceedingly wonderful experience in the USA!! When talking on the phone to Mary Ho, one of our International Leadership Team members with All Nations, she asked me to share how we did it and what we learned. So, here are the things we planned and executed that made this time in America so healthy and special. Note that these are geared more for a family than a single, but I'd say a lot still applies. They are simple and practical, but paid out in big dividends. 1. Make the visit "home" no less than three months, especially if you have a long term view and commitment. It's way too much work and far too much money to do less. This allows you to go deeper, further and broader than what you can experience in shorter times. And it also allows what's happening back on the field to develop without us. We often think way higher of ourselves than we ought to anyway. 2. No "work" for the first 2 (or 3 depending on total length) weeks! No meetings. No official business. No travel. No speaking if possible. This allows you to BE. Be funky. Be confused. Be emotional. Be crying. Be reconnecting. Be preparing for what's ahead. And this allows you to give your closest friends and family exactly what they want…YOU. Not your spiel, your speech, your pitch, or your credentials. You. They missed you. 3. Choose your accommodation very wisely! Unless your friends or family own a very large house where you can have private space, I lean toward saying don't stay with them. It seems like a good idea but will cost you way more than you thought it would. It is just so very important that you have private space to return to each day. I could go on and on about this, but rent a place or do whatever it takes to not be living on top of family and friends. We rented a furnished place for this home leave and it made a world of difference for our family. 4. Only "work" part time. Even once you get going at full speed with networking and fundraising, only plan out two or three days per week. Aim for part time and you'll hit full-time with all the unexpected requests, invitations and expectations. Do not book more than three days per week because they will book themselves. Tricia only allowed me to work a max of three days per week during this home leave and I somehow managed to pull off 40-50 hours of output without even trying. 5. Keeping your family healthy is the primary task. It takes time, energy and intentionality. It helped me a tremendous amount to see it as my main role for seven months. I had no other more important task or role. Not easy for many men to think that way but I was able to cope by reminding myself that it was temporary. If ever my family needed me present emotionally and physically it was during these last seven months! Only Tricia could tell you how I did. I always make it sound better than it is. 6. Finally, no "work" for the last two weeks. Past visits I would run like a crazy lunatic all the way up until I was about to leave for the airport. One more Pastor to see. One more donor to connect with. The result was that we would leave exhausted and terribly regretful. We decided that we would commit the final 2 to 3 weeks of our time here to do only limited work...and it's working. We've already packed 12 suitcases and only have three to go. We are ahead of the game and not feeling pressure at all. So, no work for the first two weeks and no work for the last two weeks. Quickly shows you why it's important for the visit to be at least three months. If you aren't a missionary or don't interact with them, I don't expect everything I've written here to make much sense to you. You'll think we're a bunch of lazy weaklings. Bless you. But if you are serving in missions, I hope you listen and implement some of this. But moreover, I hope it yields-year-olds the same positive results for you that it did for us. I'd be hard pressed to count how many times, as I've travelled around East Africa, that I've heard the name "Don Jacobs". He certainly left a legacy there after years of missions. I then was blessed with the honor of visiting with him in his home in April. Now I get it. What a man, full of Jesus. At the end of the visit, he handed me a small stack of books he had written, as a gift. One of them was his life story, "What a Life! - a Memoir". I've spent the last month soaking in the stories and being poured into. The history and insight about the church in East Africa was the best orientation I could've asked for before moving there in just three weeks. The cultural lessons that emerge from the stories are gems that will prevent much pain if I'll apply them. The way he honestly shared regrets and mistakes will be a grace gift to me and my family in the years to come. The values and principles weaved through the story are priceless, timeless and far too rare in Christian leaders. I want them more in my life. A few weeks back, I received a personal note in the mail from Don Jacobs reflecting on our visit and speaking prophetically that I would write my own book like this someday, and it would bless many. As I read his life story, I feel more energy than ever to faithfully live and form my story so that indeed, one day, there is something to say that will bless younger leaders like this book did me! You can buy the book on Amazon kindle by clicking here or hard copy by clicking here. I began to see a pattern in my life. It was shaped, I suppose, by being a missionary. As I look back, I see that as soon as I picked up a new responsibility I knew that, in time, I must relinquish it. Defective missionaries do not claim to a role as theirs, but seek to pass the baton to others when it is possible to do so. I was not only a missionary but a teacher. A teacher's greatest delight is to see a student surpassing even the teacher. I think I can honestly say that one of the great delights of my life has been seeing others pick up something from me, or from someone else, and then run with it. Therefore, I tried to hold lightly what I had in my hands, knowing full well that I must pass it on. To do so with joy and grace is a marvelous gift of God. Our final walk leaving Africa 6 months ago (missing Mommy and Graceson in photo). God is on the move! With recent gifts and pledges over the last 1-2 weeks, we are now at 94% of our budget raised! This is because so many of you have partnered with us in mission! 100+ people/families and over 15 churches partnered with us financially to get us this far! Thank you from the bottom of our hearts!! This puts us $15,000 or $540 per month away from our departure back to the field. We are shouting-excited. God's faithfulness continues to astound us. We are still trusting God for a June 1 departure, but still need a few more investments from people like you. Thank you for standing with us, praying with us and believing with us! We won't forget what this is all for....JESUS and HIS great news of healing and transformation for the nations! About 10 days ago we shared HERE about our fundraising journey. We shared that we were trusting God for a miracle of $27,500 in gifts so we could leave for Africa. Today, we are encouraged to report that we are down to $22,500! The Lord provided $5,000 in 10 days! That's a $500 miracle a day! So, the journey continues. If you (or anyone you may know) wants to make a one time contribution toward our ministry, we would be ever so grateful. You can do it by clicking right here. Even if you're unable to give, would you stand with us in faith and prayer or maybe share this with others? We have heard God call us, and now we watch in awe as He provides for what he has asked. It's a nail biter at times, but yet so fun! Much Love from the Kaye's!